Good value, very easy to use, perfectly functional. Quite small at only 17 litre capacity - measures 31.5cm by 27.9cm by 21.0cm inside. 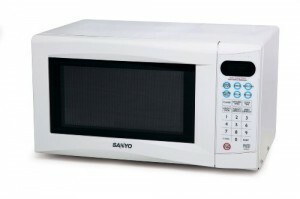 The Sanyo EM-S155AW is a relatively cheap small white solo microwave, priced at around the £60 mark. Granted, it is pretty small, but it has several positives. Firstly the controls are very easy to use - being well labelled, and as such this will be ideal for those who struggle with technology. Secondly it offers very good value - the build quality is pretty good, and Sanyo tends to be a reliable manufacturer. 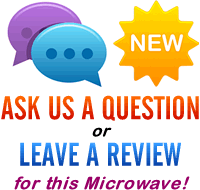 Add to this the extensive cooking options that the EM-S155AW provides and all in all, you have an excellent small solo microwave. Finished in white, it's design is more functional than aesthetically beautiful, but nonetheless our testers were positive about the overall design and construction of this offering from Sanyo. The total power output of this microwave is 700w, divided into 10 different power levels, with the timing system going up to a maximum of 99 minutes. Simple to use, works well, and offers good value. If you're after a small solo microwave then it's well worth considering the Sanyo EM-S155AW. can i have an instruction book on the sanyo microwave em-s155aw.